Ring News 24Boxing Interviews Boxing News Breaking Boxing NewsPart 6 | Is Anthony Joshua ready for Klitschko? Anthony Joshua will fight Wladimir Klitschko in their heavyweight title bout at Wembley on the 29th of April. 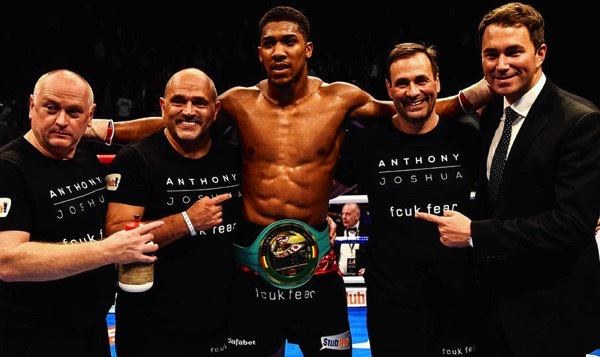 Joshua will defend the IBF title for the third time against the Ukrainian. The WBA belt vacated by Tyson Fury is also on the line. “Fortunately, I haven’t got that put on me. “He’s a great big lump. He’s going to hold you, that’s for a start – you got to keep it long. I think Josh has got a wonderful, wonderful jab and so has Klitschko. At the end of the day, all Klitschko does it jab and hold, jab and hold. “Joshua has got to use his speed, speed, speed and the speed and the movement will do Klitschko. Once Joshua connects with that right hand it’s good night, that is good night. I don’t care who he hits on the chin, they’re heavyweights, either one can get knocked out, they know that. Do you have a prediction on the fight? “I think it will be seven or eight rounds. I think Joshua will be too fast to strong, certainly too fast. “Soon as Joshua starts unloading it will be good night. He’ll have too much movement for him. If Joshua starts moving like he can really move. “Probably on paper it will be his biggest test so far. Being honest some of his opponents he hasn’t been tested. So he hasn’t had to show his ability, not his true ability. If he starts to show his true ability people then will really take to him. It’s hard to argue when some says “Joshua hasn’t been tested” especially when you consider all 18 opponents have been knocked-out. Klitschko on paper should be his toughest test to date – Do you think we see the best Joshua against Klitschko? “No, I think there’s still a lot more to come because he’s only 27. “He walked into the gym in 2008 as a complete novice and within four years he won four ABA titles, three Nations gold medals, three Harrogate Boxing Club gold medals, two gold medals in the Eastern block, a world silver medal and an Olympic gold medal all in four years. “I’d like to know anybody who’s done that in four years – It’s just an incredible talent.